Cricket umpires salaries were low as compared to the football referees. There is a report published by sports magazine in 2013. According to them an elite panel umpire get paid $2,500 in a test match. He make $800 in an ODI match fees. 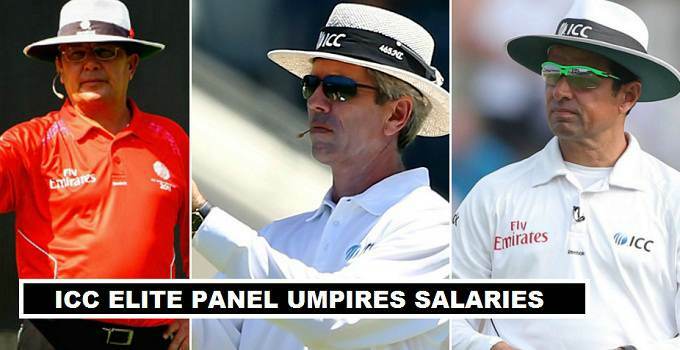 With passage of time big changes made to the umpires pay scale in last two years, there is almost 15% hike in their salaries that made their annual earnings quite good enough. All elite members of ICC Panel did not earn equally. Some umpires selected for the third umpire position before the match and they maximum earn $400 per T20 match and ($800) each ODI match. Umpires regularly selected for the matches main umpires duty on field earn big salaries as you see in the above table. According to estimated amount elite panel umpire earn ($450,000) annually from all match series and ICC trophies. Umpires who are part of elite panel and mostly selected for 3rd umpire in the match earn ($250,000) annually. All ICC umpires wears the shirts that have sponsor logo of (Fly Emirates). They enjoy free travel, accomodation and food. In past five years umpires selected for the ICC World Cup, ICC World T20, and ICC Champions Trophy matches earn pretty well from the tournaments. According to sources closer to the ICC Cricket, the two umpire on field earn ($2,500) and third umpire earn ($1,000) per match. Recently, ICC announced four members women cricket panel for women world cup 2017. Which include (Adrian Griffith, Kathleen Cross, Sue Redfern, and Jacqueline Williams). There are some reports that these women earn ($500) per match on base of their selection during.